World Rugby (www.WorldRugby.org) Africa association, Rugby Africa (www.RugbyAfrique.com), today unveiled its 2018 Competition Schedule. The year promises to be particularly busy with 10 competitions totalling more than one hundred fifteen-a-side and sevens rugby matches and up to 32 participating countries. The 2018 African champion will automatically qualify for the 2019 World Cup in Japan (www.RugbyWorldCup.com), though the runner-up will participate in a last chance bracket tournament. The Rugby Africa Bronze Cup will then take place from the 9th to the 12th of May in Accra, Ghana. Reformulated for the occasion in a four-team competition, this tournament is the gateway to Rugby Africa's men's rugby competition. Lesotho and Ghana make their first appearance at this level following Lesotho’s victory in the Regional Challenge 2017 and Ghana’s acquisition of full membership status of World Rugby. Ladies will be under the spotlight in May and June with a women's leadership forum followed by the Africa Women's Sevens tournament with ten teams. The exact dates and location are still under discussion but promise a nice surprise. The Rugby Africa Gold Cup will kick-off on 16 June and will continue until 18 August. With the six best African rugby nations competing, this is Rugby Africa's flagship competition which fans can follow live on Kwesé Sports (http://Kwese.ESPN.com) and Facebook Live. After 15 matches played in 6 different countries, we will know which team will carry the hopes of Africa alongside South Africa at the 2019 World Cup, while another team will get a second chance in the international repechage tournament. Whilst the Gold Cup will break due to a very busy international calendar - in particular with the Sevens Rugby World Cup from July 20th to 22nd in San Francisco - the next best-ranked six teams of Africa will compete in two pools as part of the Rugby Africa Silver Cup from July 8th to 14th. A final match between the two pools’ winners will later decide the promoted team in the Gold Cup for the following year. Finally, the season will end in September and October with a sequence of three men's rugby sevens tournaments. In the first place, two sub-regional tournaments will see up to 20 countries compete for qualification in the last round of Olympic qualifying in 2019. 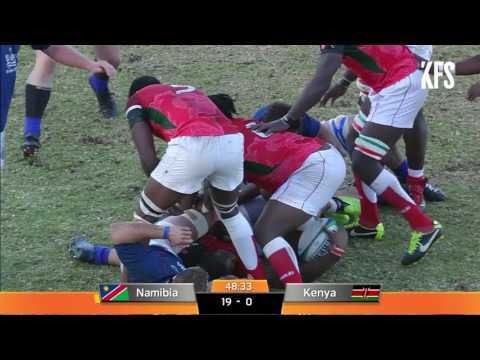 Then in October the 12 best African sevens rugby nations will compete for the title of 2018 African champion and a chance to be invited to some stages of the World Series and the repechage tournament that would allow them to join South Africa and Kenya in the prestigious circuit. “It's a rich and well-articulated program that we offer to rugby federations and fans in Africa. Rugby Africa wants to involve as many countries as possible in its continental competitions. This we do in a spirit of solidarity but also to allow local rugby to develop by having the opportunity to progress and play in bigger tournaments. The participation and hosting of continental competitions are important arguments for retaining talent but also to gain support from institutional and private partners,” said Abdelaziz Bougja, President of Rugby Africa. “The spotlight will be on the Rugby Africa Gold Cup this year, as the competition allows qualification for the 2019 World Cup. It will be a hard contest between the six countries in the running, and they will all give their best and will mobilise their best teams to try to earn their ticket to the World Cup. Rugby Africa will be supporting them to organise very high-level tournaments. Thanks to Kwesé Sports who will broadcast all the matches live and to our official partner APO Group, our public relations agency, we will talk a lot about African rugby in 2018 on the continent and beyond and we hope to raise awareness around our sport and its value”, says Guédel N'Diaye, director of competitions at Rugby Africa. “The popularity of rugby is exploding all over Africa. In 2017, more than 22,000 schools taught rugby across the continent. That's 25% more than in 2016. The number of African women and girls playing rugby has increased by 50% between 2016 and 2017. Today, 20% of rugby players in Africa are women and girls. This impressive growth will continue in 2018, driven by the enthusiasm around the qualifiers for the 2019 Rugby World Cup. In 2018, several African nations will compete for one or two spots at the 2019 Rugby World Cup, the third largest sporting event in the world. As Official Partner of Rugby Africa, we will ensure that the spotlight of African and international media remains firmly on African rugby,” said APO Group (www.APO-opa.com) founder and CEO, Rugby Africa's Official Partner, Nicolas Pompigne- Mognard. This is a joint press release by Rugby Africa and APO Group. Founded in 1986, Rugby Africa (www.RugbyAfrique.com), formerly known as the Confederation of African Rugby or CAR, is one of the six regional associations of World Rugby (WorldRugby.org), the international body that manages rugby 15 and rugby sevens. Rugby Africa brings together African nations playing rugby 15s, rugby 7s for both men and women. Rugby Africa organizes the Rugby Africa Gold Cup, qualifying competition for the 2019 Rugby World Cup, and Africa Men’s and Women’s 7s, qualifying competitions for the 2020 Olympic Games as well as a range of other tournaments involving 20 countries in 15s rugby and more than 30 in Sevens. Rugby Africa has 38 members, including 22 members or associate members of World Rugby, 10 members or associate members of Rugby Africa and 16 new countries working with Rugby Africa. Headquarter: Lausanne, Switzerland | Offices in Senegal, Dubai and Hong Kong. Rugby Africa unveils the 2018 Competition Schedule: 32 African countries, 10 competitions, more than 100 matches The 2018 African champion will automatically qualify for the 2019 World Cup in Japan, though the runner-up will participate in a last chance bracket tournament CAPE TOWN, South Africa, December 13, 2017/APO Group/ -- World Rugby (www.WorldRugby.org) Africa association, Rugby Africa (www.RugbyAfrique.com), today unveiled its 2018 Competition Schedule. The year promises to be particularly busy with 10 competitions totalling more than one hundred fifteen-a-side and sevens rugby matches and up to 32 participating countries. The 2018 African champion will automatically qualify for the 2019 World Cup in Japan (www.RugbyWorldCup.com), though the runner-up will participate in a last chance bracket tournament. The U20 Barthés Trophy will kick-off Rugby Africa’s competitions from March 28th to March 31st, 2018 and it will decide the under-20 team that will represent Africa at the Junior World Trophy later in the year. Stakes are high right from the start of the season. The Rugby Africa Bronze Cup will then take place from the 9th to the 12th of May in Accra, Ghana. Reformulated for the occasion in a four-team competition, this tournament is the gateway to Rugby Africa's men's rugby competition. Lesotho and Ghana make their first appearance at this level following Lesotho’s victory in the Regional Challenge 2017 and Ghana’s acquisition of full membership status of World Rugby. Ladies will be under the spotlight in May and June with a women's leadership forum followed by the Africa Women's Sevens tournament with ten teams. The exact dates and location are still under discussion but promise a nice surprise. The Rugby Africa Gold Cup will kick-off on 16 June and will continue until 18 August. With the six best African rugby nations competing, this is Rugby Africa's flagship competition which fans can follow live on Kwesé Sports (http://Kwese.ESPN.com) and Facebook Live. After 15 matches played in 6 different countries, we will know which team will carry the hopes of Africa alongside South Africa at the 2019 World Cup, while another team will get a second chance in the international repechage tournament. Whilst the Gold Cup will break due to a very busy international calendar - in particular with the Sevens Rugby World Cup from July 20th to 22nd in San Francisco - the next best-ranked six teams of Africa will compete in two pools as part of the Rugby Africa Silver Cup from July 8th to 14th. A final match between the two pools’ winners will later decide the promoted team in the Gold Cup for the following year. Finally, the season will end in September and October with a sequence of three men's rugby sevens tournaments. In the first place, two sub-regional tournaments will see up to 20 countries compete for qualification in the last round of Olympic qualifying in 2019. Then in October the 12 best African sevens rugby nations will compete for the title of 2018 African champion and a chance to be invited to some stages of the World Series and the repechage tournament that would allow them to join South Africa and Kenya in the prestigious circuit. “It's a rich and well-articulated program that we offer to rugby federations and fans in Africa. Rugby Africa wants to involve as many countries as possible in its continental competitions. This we do in a spirit of solidarity but also to allow local rugby to develop by having the opportunity to progress and play in bigger tournaments. The participation and hosting of continental competitions are important arguments for retaining talent but also to gain support from institutional and private partners,” said Abdelaziz Bougja, President of Rugby Africa. “The spotlight will be on the Rugby Africa Gold Cup this year, as the competition allows qualification for the 2019 World Cup. It will be a hard contest between the six countries in the running, and they will all give their best and will mobilise their best teams to try to earn their ticket to the World Cup. Rugby Africa will be supporting them to organise very high-level tournaments. Thanks to Kwesé Sports who will broadcast all the matches live and to our official partner APO Group, our public relations agency, we will talk a lot about African rugby in 2018 on the continent and beyond and we hope to raise awareness around our sport and its value”, says Guédel N'Diaye, director of competitions at Rugby Africa. “Kwesé Sports is very excited about our partnership with Rugby Africa and we are looking forward to the start of the 2018 season, our 2nd season out of 5 with Rugby Africa. 2017 season was a very successful start for our relationship and we are very confident our partnership will grow the sport on the African continent. We wish all the teams the very best of success as we also welcome Morocco, a new contender into the Rugby Africa Gold Cup for 2018, as well as all our African teams competing in the Rugby World Cup 7’s in San Francisco in 2018, all the very best”, commented Jeroen Oerlemans, CEO of Kwese Sports. “The popularity of rugby is exploding all over Africa. In 2017, more than 22,000 schools taught rugby across the continent. That's 25% more than in 2016. The number of African women and girls playing rugby has increased by 50% between 2016 and 2017. Today, 20% of rugby players in Africa are women and girls. This impressive growth will continue in 2018, driven by the enthusiasm around the qualifiers for the 2019 Rugby World Cup. In 2018, several African nations will compete for one or two spots at the 2019 Rugby World Cup, the third largest sporting event in the world. As Official Partner of Rugby Africa, we will ensure that the spotlight of African and international media remains firmly on African rugby,” said APO Group (www.APO-opa.com) founder and CEO, Rugby Africa's Official Partner, Nicolas Pompigne- Mognard. Click on the link to see the full fixtures: http://APO.af/u6TRUq This is a joint press release by Rugby Africa and APO Group. Distributed by APO Group on behalf of Rugby Africa.